The evidence that the alignments found are real and were planned. The only fixed times in the solar calendar are the solstices and it would be necessary to know when they occurred in order to set up the calendar. Thereafter it would be important to know the day of the solstices in order to keep a check on the calendar use. This can in principle and with difficulty be done by using a very long alignment to determine the actual day of the solstice by observation of the very small movement of the sun near the solstices. Variable refraction would be a potentially serious matter. Ballochroy in Kintyre and Kintraw in Argyll may be of this type. Alternatively the method of ‘halving the difference’ whereby the sun is observed at a foresight a few days before and after the solstice is much easier. However it has been claimed that there is no certainty that any alignments of this nature are not quite likely to be due to chance. E.g. “…., the chances are appreciable of finding an acceptable notch within a degree or so …. from one of the extreme positions. Any such notch is susceptible to the ‘halving the difference’ argument, so that the mere presence of such a notch in the general direction of the alignment of features at a monument such as Brainport Bay (MacKie 1981; 1988 ) does not constitute any sort of proof that it was used in this way….”. Ruggles 1999: 32). At each of the three alignments the solstice is less than the sun's diameter beyond the alignment. The point here is that there is no ambiguity about which limb is to be observed and would help to confirm the alignment. Ruggles talks of "......within a degree or so." Given that the sun subtends an angle of close to half a degree I would contend that Ruggles "..within a degree or so" is too vague and too wide. 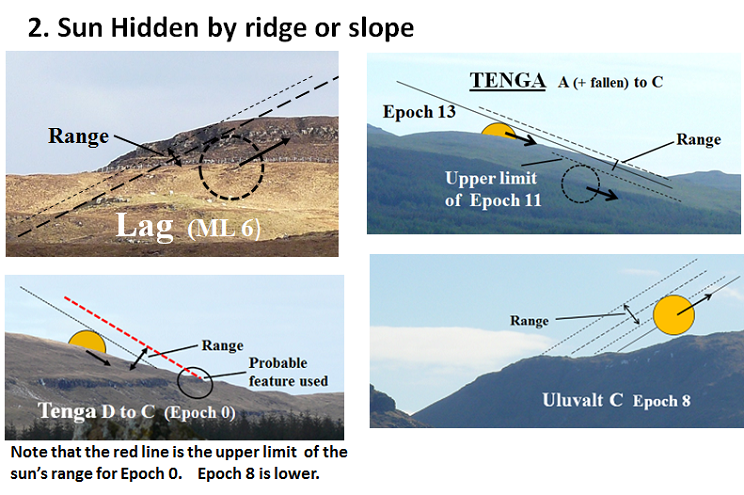 There are now five sites known (see below) and suitable for halving the difference and all of them have a clear feature within less than half a degree of the solstice. In addition to the four sites as above, there is also the site at Brainport (MacKie 1981: 128-137, 1988: 213-224). For the alignment at Brainport near the midsummer solstice it had been assumed that the upper limb was observed (MacKie 1988: 214). This would make the distance between the solstice and the alignment ‘notch’ about 1 ½ solar diameters (0⁰.8). 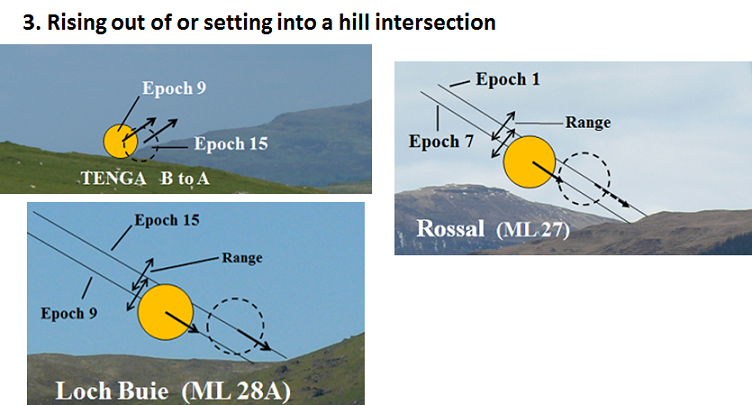 This is possible, but the points noted above tell us that it is more likely that the lower limb was observed. This limb would then be at the alignment point 9 days before/after the solstice, travel less than the sun’s diameter and would mean that the sun was visible before the time of observation. All of the above five alignments fit a clear pattern:- The sun takes almost exactly 12 days to move its own diameter from the solstice and so by choosing a suitable foresight and positioning the backsight as required the foresight is passed in less than 12 days. This removes ambiguity regarding the limb observed. The evidence presented here means that the balance has now moved to strongly favour of the existence of use of the method of 'halving the difference', and therefore that Ruggles' reservations are shown to be, almost certainly, over cautious. 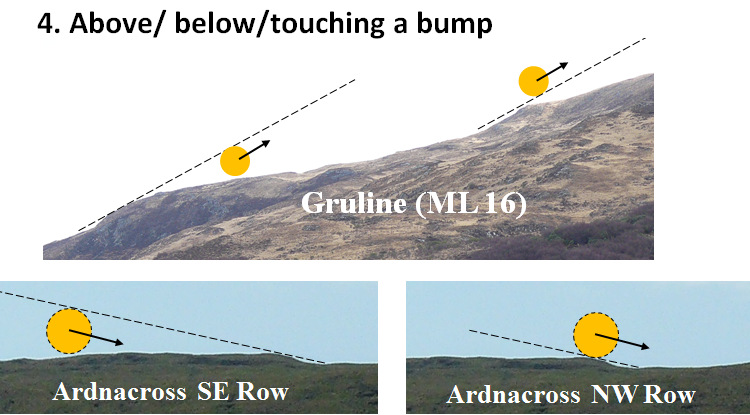 When we consider the double alignment from the same backsight at Gruline together with the supporting evidence of the (winter) solstial alignments at Ardnacross and the (summer) solstitial alignment at Gruline, any claims that solar alignments are likely to be due to chance begin to seem very improbable. The alignments at Tenga can only reinforce this view. The sun rising or setting into or out of a dip of hollow which is wide enough to fit the sun + the four yearly range. The rising sun is initially hidden below a rising ridge/slope which is nearly parallel to the path of the sun or it sets into or rises from such a feature. In both cases a day earlier/later, depending on the sun's direction of movement, it would in most cases be visible. The day sought is therefore the day immediately before/after the sun is visible depending upon its direction of movement. 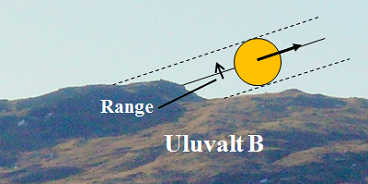 Either:- The sun passes behind a bump or a small but distinct hill and is briefly hidden by the feature or it passes just clear of such a feature. The inference from these examples is that it was the sun not appearing ( or actually disappearing) that for calendrical purposes, determined the day. The doubts concerning the method of finding the day of the solstice by using the method of 'halving the difference' has been discussed above and shown to be unduly pessimistic. The evidence is strong that the method was used at both Ardnacross and Gruline. For the reasons given above and summarised below it would seem to be an inescapable fact that the alignments are real and were planned. A group of stones was assessed. The double alignment at Gruline from the same observing position. The table above indicates the significant number of alignments found on the island and with very little duplication. Given the solar alignments found it seems very likely that the prehistoric calendar as proposed by Thom existed, at least on the island of Mull. The results also serve to confirm that the declinations derived by Thom from the histogram of declinations found, and found without any anticipation of the evidence that it would give, are essentially correct. Since the histogram was based on measurements from widely scattered sites the only logical conclusion must be that solar alignments are likely to be common. The most likely reason for this is that the prehistoric calendar was in general use. The possible reasons for a desire/need for a relatively accurate calendar. It is known that in Ireland there was in the 5th century A.D. certain dates which were considered important and given names - Imbolc, Beltaine, Lughnasadh and Samhain. These fell close to the quarter days and might have originated in a prehistoric calendar.